After starting a blog with my endeavours with the Space Wolves of Bran Redmaw and then my dalliance with doing my own IG army using the plastic Cadians, I decided I'd bite the bullet and start something completely new- Death Korps. I have always loved the DKoK models and the fluff is rather nifty too. I have always had a (some might say unhealthy) fascination with the Wehrmacht of WW2, namely the uniforms and equipment and while the DKoK may look more WW1 in appearance, they more than fit the bill for a winter themed army. Specifically, the Ardennes Offensive- lots of tanks, greatcoat-wearing infantry, trees and snow. If any one has any criticisms please don't hesitate to tell me, I'd rather know something is gak and attempt to improve upon it! So, mud? Check. Snow? Check. Rebreathers? Check. Fantastic, very well done. i would only say perhaps doing some more to the snow. Maybe create a slush by mixing some water and pva in with the snow flock. Thanks TheFireDrake. I do need to go back and tend to the snow- it's actually a mix of snow flock, PVA and water with some extra snow flock sprinkled on top. I think I'll go back over it again as it does look a bit grassy. 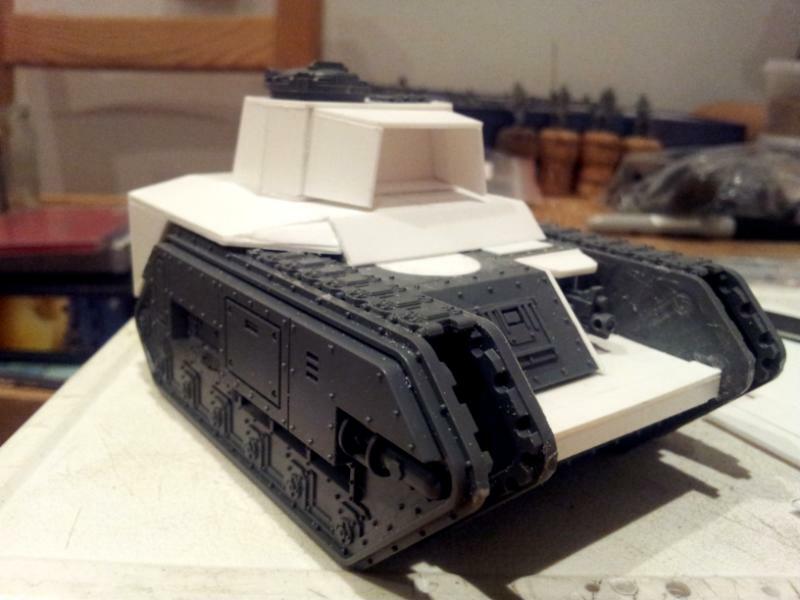 I should probably say that the above tank is my take on a mini-Macharius and will form the basis of my Leman Russ MBTs. 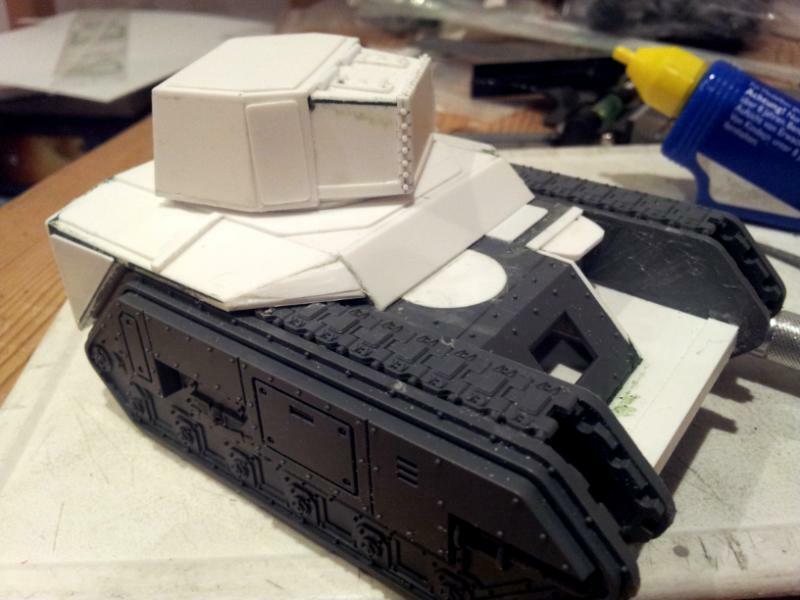 I had a load of plans drawn up for the chassis and the rear armoured section but then I came to the turret and I'm kinda winging it! 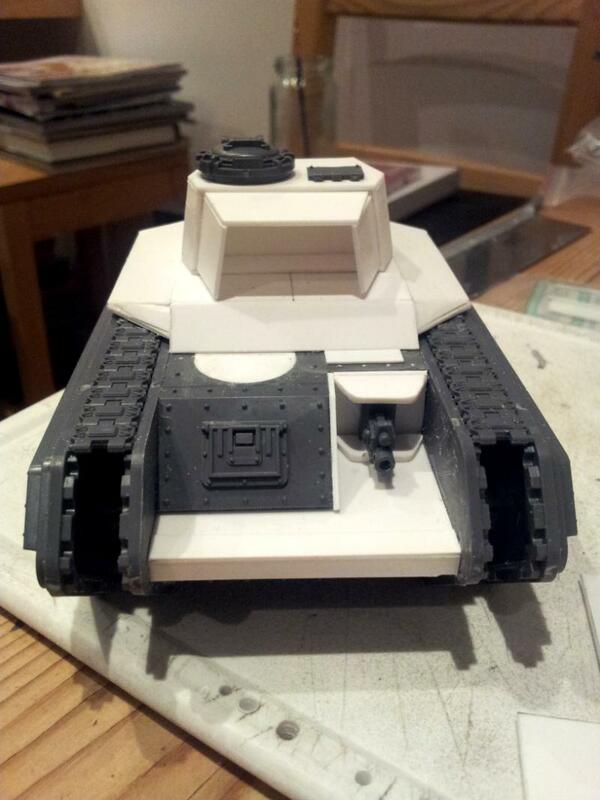 This particular tank will have a punisher gatling cannon which will be made from brass rods and have a cowling similar to that of the Vulcan Macharius, except it will only have one 6-barrel assembly on the left of the turret and a targeting array on the right in front of the commanders hatch. Brass tubes have been ordered, 2mm and 3mm, so hopefully they will turn up by the end of the week. 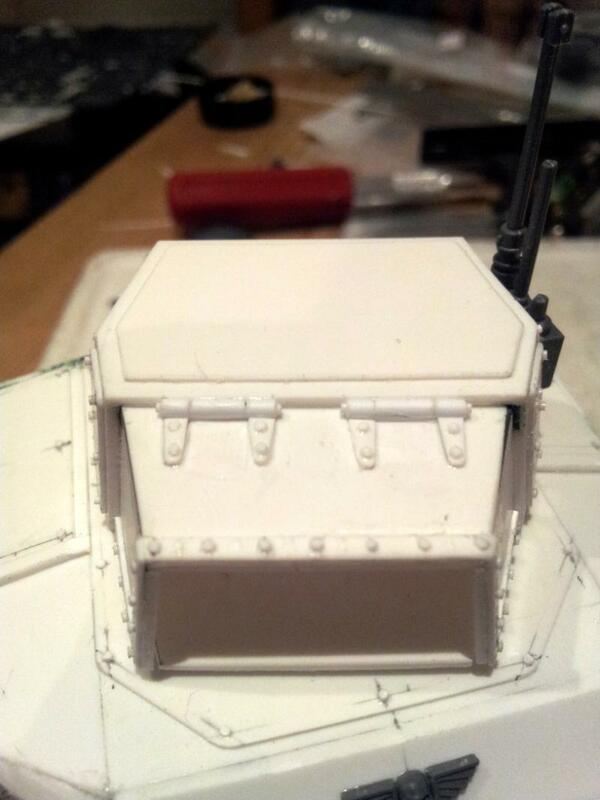 I've ordered some rod too so I can make handles for hatches and a ladder to the commanders hatch. I'm yet to decide on how to do the exhausts, any ideas people? 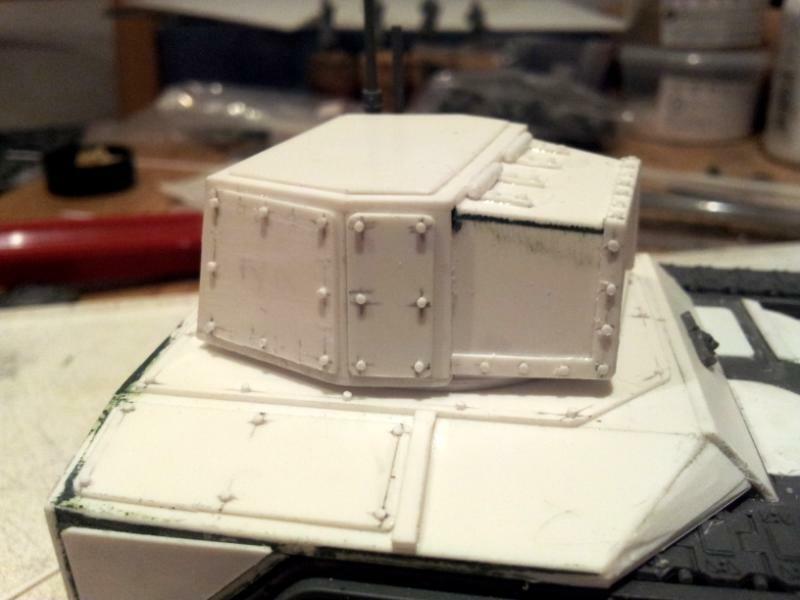 Started filling in the gaps tonight, adding the segmented armour panels and hinges to the cowl on the turret- tried to emulate the Vulcan turret for this. Very nice work there mate! Really love the look of this and the proportions and angles look great! Cant wait to see more detail as it progresses! Anyway... i am blethereing...... Cant wait to see more! Amazing start to this thread. Love the colour scheme that you've chosen. Suitably realistic and gritty. The mini-Macharius look is shaping up to be a classic. @MagosBiff90, I've ordered some 1mm brass rod from Ebay with which I will do the ladders and handles. 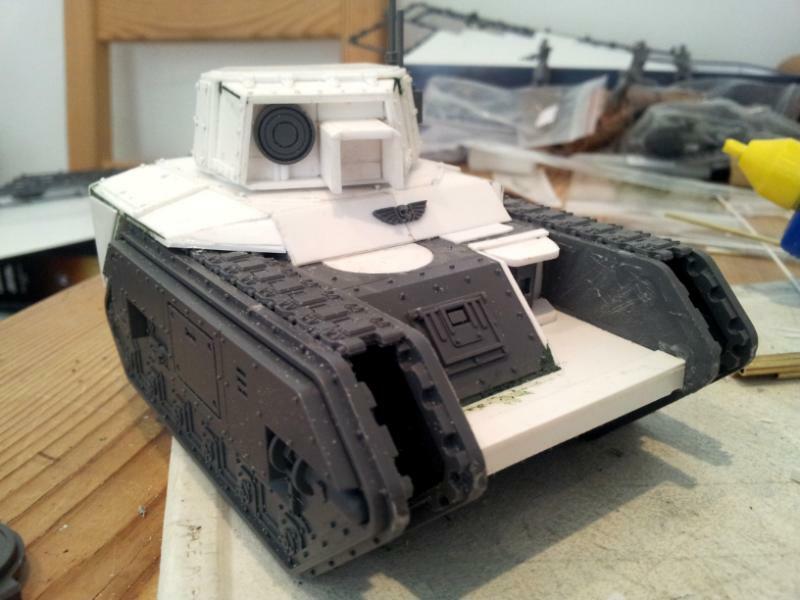 @Medium of Death, I'm going to attempt the same weathered white-wash look on the tank which will no doubt be interesting and result in much swearing! Ace, look forward to that beast being battle ready. White vehicles are just ace, they love weathering. Cheers! 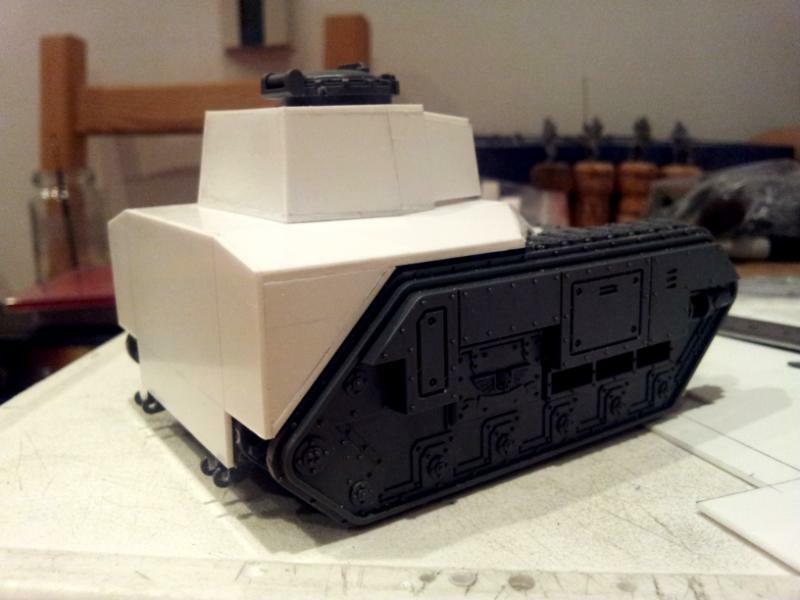 I'm feeling quite apprehensive about painting this tank- I kinda the together the last one I made and the care I'm taking over this would make it a real shame if I made a mess of the paint! Looking awesome there mate! 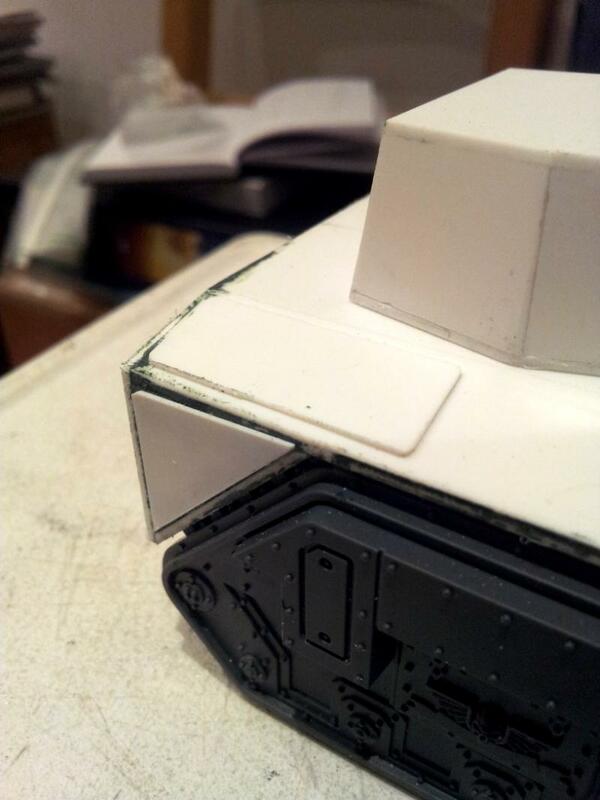 Really like how this tank is shaping up and those rivets.... sweet! Am sure you will smash the paintwork! No worries! Keeping my eye on this one! @MagosBiff90, thanks for your faith! I was going to ask if perhaps I'd gone a little overboard with the rivets? The one thing i have learned... is that when it comes to rivets.... you can never have enough rivets! Na in all seriousness it looks cool mate! Cool. After looking at the canopy hinges though, I think I'll do them again but tapered and with smaller rivets. 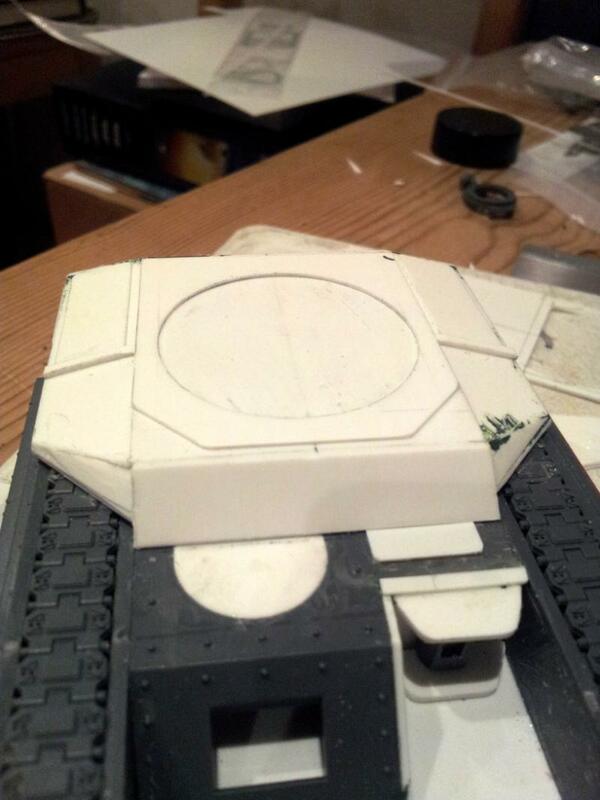 I'll finish the side panels and start on the rear armour. If the bras tubes have arrived, I may even start on the gun. 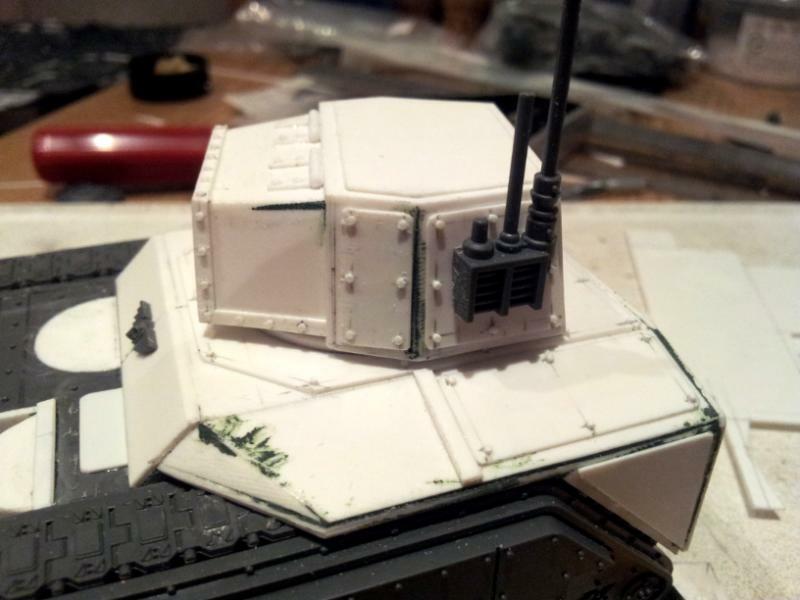 Progress is slow- added more panels, rivets to said panels and the comms thing from the chimera sprue (will probably replace the thick antennae for thin wire ones). I also removed some of the rivets from the trim of the canopy as it looked a little crowded compared to the Macharius one. Very nice work! 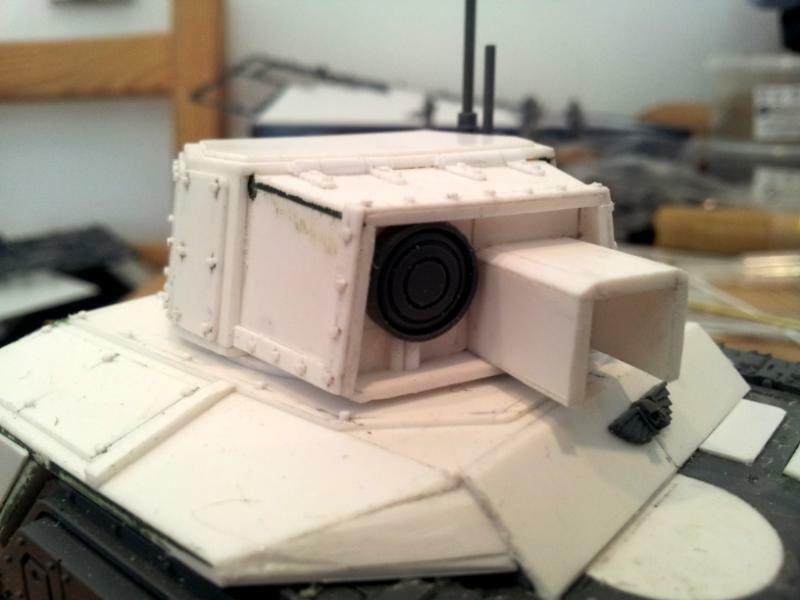 Those details on that turret look great allready even at this early stage! 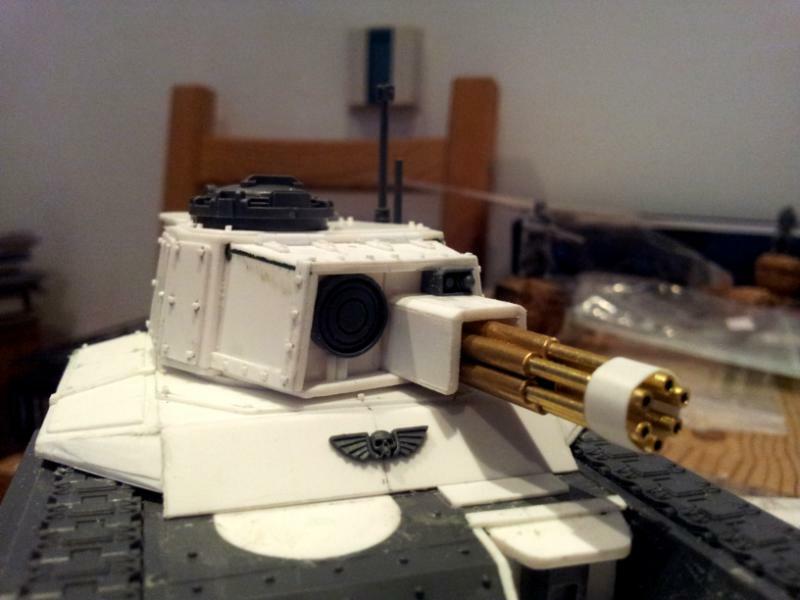 Cant wait to see the gun mounted so we can get an idea of the real form of the turret and the balance of it! Really cool stuff! Thanks MagosBiff90, I'm going to try and get the barrels done this evening. 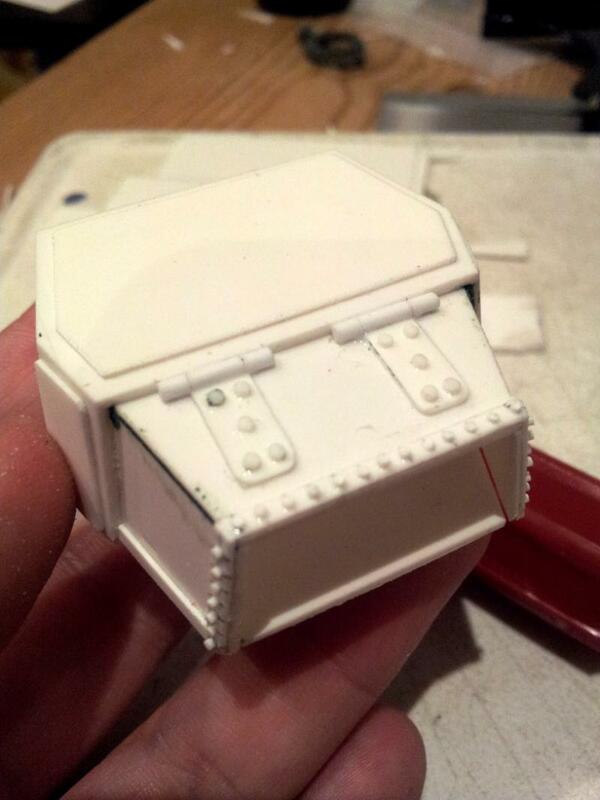 I've managed to get part of the storage box done on the back of the turret and some extra plates on the hull. Depending on how I get on with the barrels, I may webbed start detailing the rear. Haha, yes rivets will probably be the death of me! I have plans to do a couple more of these beasts- hopefully I'll have streamlined the process and I'll be able to build them simultaneously. Just out of interest, does anyone know if you can get angled styrene tube? Angled in which way or do you mean? bend? 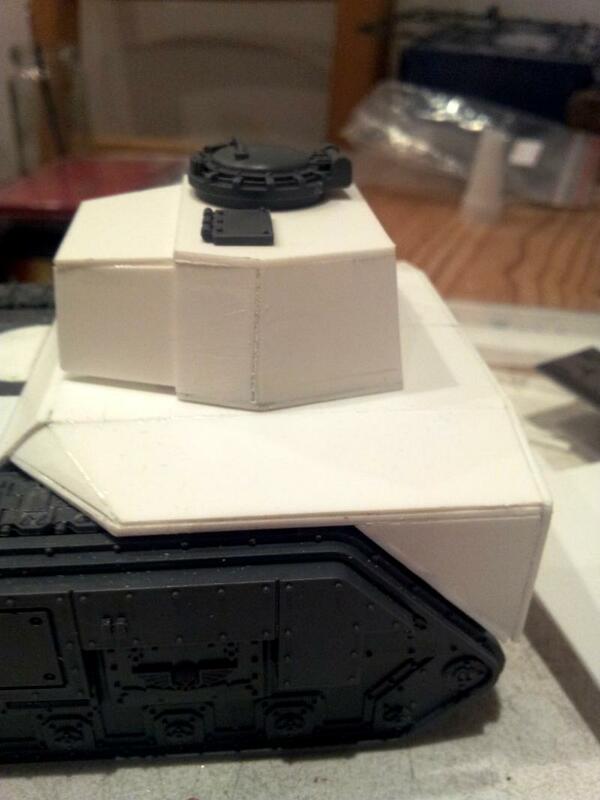 Finished the gatling cannon and the storage container at the back of the turret. 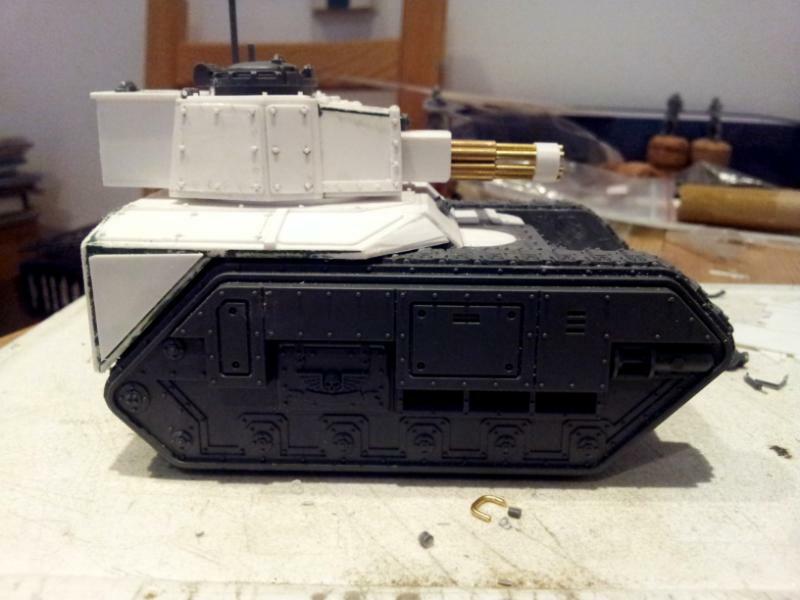 I need to work on the hatches for the rear of the tank plus I've ordered some tubes which I'll bend for the exhausts using a hair dryer- found a tutorial online about how to do it, seems simple enough. 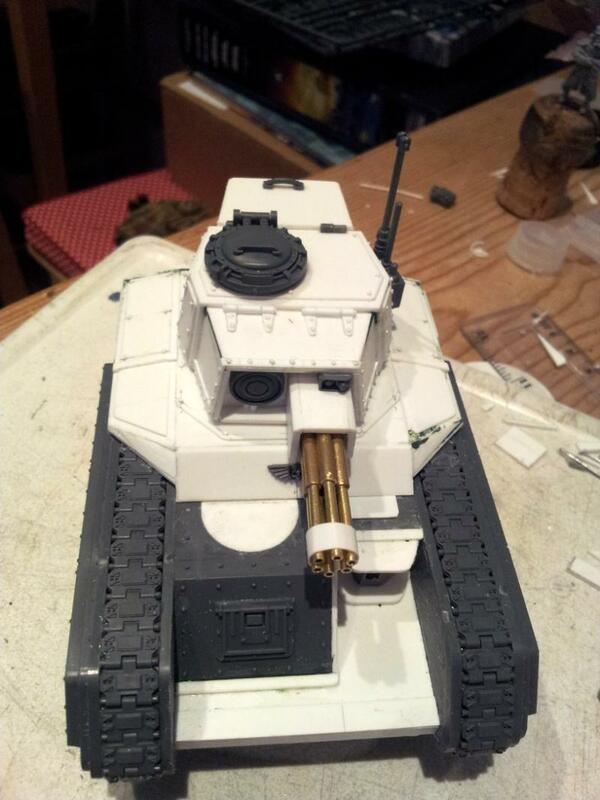 Thats a well done tank! Apologies fellow Dakkanaughts but I've been busy the past couple of nights (theatre and pub last night and painting icons for an F1 Ferrari car cake that my fiancée is making tonight!) but I haven't been totally idle. I've been researching the best way to do a white-wash winter camouflage scheme on my vehicles and I think I've found the perfect one by none other that Mig Jimenez. The styrene tubes still haven't arrived so exhausts won't be done until they do. 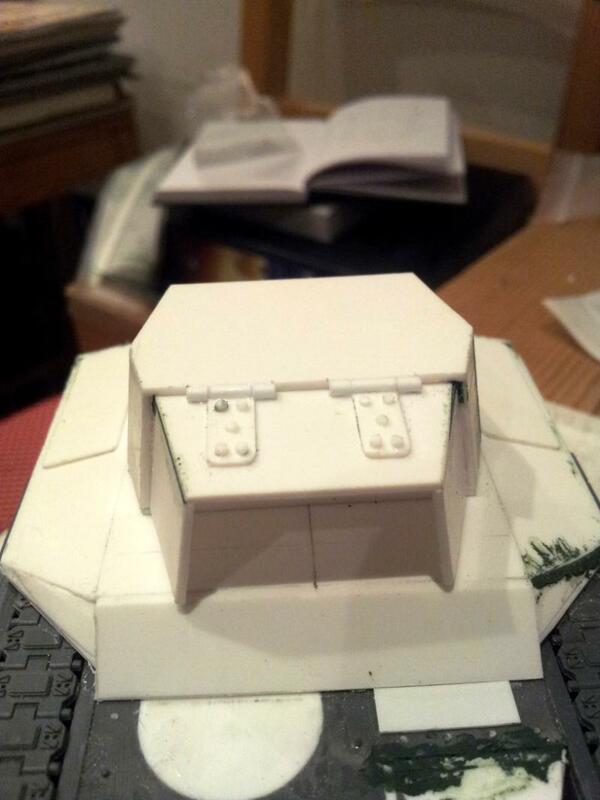 I'll have to make a start on the vents and the rear hatches instead. 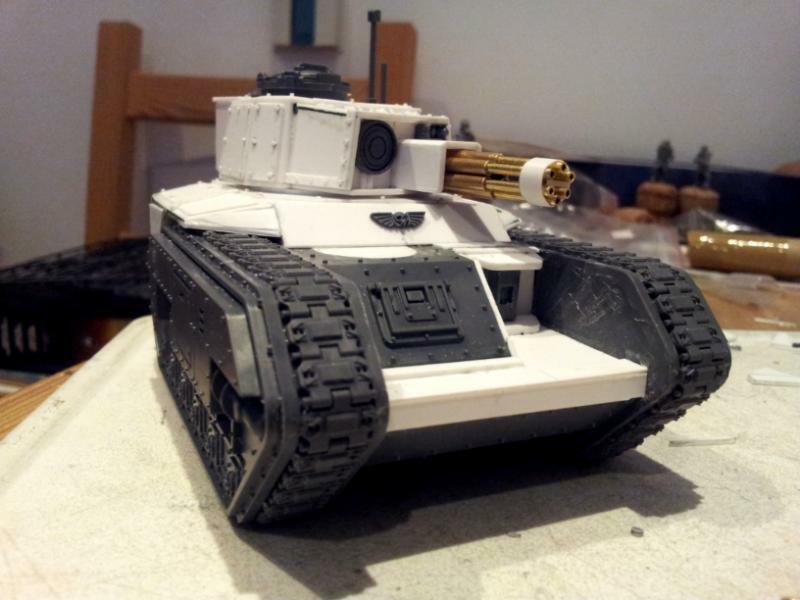 That's the exact scheme I was going for on my Dkok...before they...melted. Brilliant! And awesome Macharius type tank. Blacksails wrote: Maybe you should read your own posts before calling someone else's juvenile. Glorious work on that tank. Can't wait to see it finished and painted!